The story opens with the murder of Ronald Adair. Holmes tells Watson his account of tangling with Professor Moriarty and explains his expectation that someone will attempt to murder him. He sets up a dummy across the street, which is shot with an airgun. The killer is arrested. Holmes and Watson are visited by John Hector McFarlane. A murder occurs at Jonas Oldacre’s house in Norwood and McFarlane is accused. Holmes follows the clues to deduce that Oldacre faked his death. Elsie marries Hilton Cubitt and tells him not to ask her about her past. She gets a letters from the United States and pictures of small dancing men start appearing everywhere around her. Holmes is brought in to get to the bottom of the pictures. From then on, things get worse until Holmes cracks the case. Holmes is contacted by Violet Smith. When she is followed by a strange man in a bicycle, Holmes decides to get to the bottom of it. When Violet is abducted, Holmes goes after the cyclist and discovers they’re both on the same side. Holmes tracks down the killers. Thorneycroft Huxtable, a principal at a New England prep school, comes to Holmes with the news that a student has been kidnapped. They must do what they can to track him down. Holmes and Watson find more clues as to the kidnapping of a prep school student. When the clues point to James Wilder, Holmes and Watson stop at nothing to catch him. A gruesome murder occurs in Forest Row and Police Inspector Stanley Hopkins asks Holmes for help. When Peter Carey’s (also called Black Peter) tobacco pouch is found at the scene of the crime, Holmes investigates. When someone blackmails Lady Eva Blackwell, Holmes is called to the case. He disguises himself as a plumber and goes undercover to catch the blackmailer. Holmes is called to investigate a case about a man who shatters busts of Napoleon. When a murder occurs, Holmes must work faster to solve the mystery. Holmes finds himself at a university town and discovers that a tutor’s office had been disturbed and Holmes suspects Bannister the servant. Inspector Stanley Hopkins asks Holmes to investigate the murder of Willoughby Smith, a murder with no apparent motive. Holmes, along with Dr. Watson and Inspector Hopkins, must get to the bottom of the mystery. 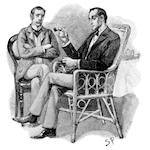 When Gaudfrey Staunton disappears, Cyril Overton asks Holmes to investigate. Dr. Armstrong is suspected. Sir Eustace has been killed at the Abbey Grange and Holmes and Watson go to investigate. Lady Brackenstall’s past and former loves play a key role in the case and Holmes and Watson must solve the mystery. Lord Bellinger and Trelawney Hope come to Holmes to explain about a stolen document. When Watson tells Holmes that one of his known spies has been murdered, they must solve the case. Doyle, Arthur Conan. The Return of Sherlock Holmes. Lit2Go Edition. 1905. Web. <https://etc.usf.edu/lit2go/178/the-return-of-sherlock-holmes/>. April 18, 2019. Arthur Conan Doyle, The Return of Sherlock Holmes, Li2Go edition, (1905), accessed April 18, 2019, https://etc.usf.edu/lit2go/178/the-return-of-sherlock-holmes/.